Who doesn’t want to enjoy delicious cocktail drinks, but what about calories? Since typical margaritas clock in at around 500-600 calories, I started to think about healthier, low-cal versions of popular drinks and cocktails. Want to know what Skinny Chef is sipping this summer? 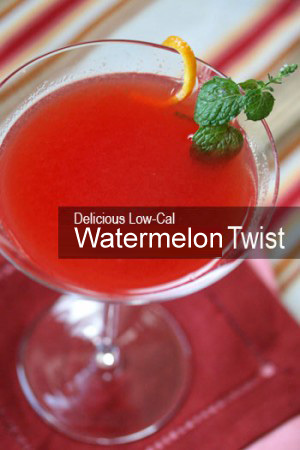 Try my super refreshing, low-cal cocktail, the Watermelon Twist made from watermelon juice, prosecco and Aperol – a rhubarb orange flavored liquor from Italy. It’s really easy to make, and has just 96 calories for 6 ounces. Step 2: Fill a large cocktail shaker half way full with ice. Place the watermelon juice, the prosecco, and the Aperol into the cocktail shaker. Cover and shake well. Step 3: Pour into two martini glasses and serve immediately. (6-ounces): 96 calories, 0 g protein, 7 g carbohydrates, 0 g fat (0 g saturated), 0 mg cholesterol, 0 g fiber, 0 mg sodium.